Clonmel Motor Tax Office, Civic Offices, Clonmel, Co. Tipperary & Nenagh Motor Tax Office, Civic Offices, Nenagh, Co. Tipperary. Tipperary County Council requires customers’ to provide certain personal data in order to carry out our legislative and administrative functions for Motor Tax on behalf of Department of Transport, Tourism & Sport (DTTAS). Tipperary County Council will treat all information and personal data you provide as confidential, in accordance with General Data Protection Regulations and Data Protection legislation. Full details of DTTAS Data Protection policy setting out how we will use your personal data as well as information regarding your rights as a data subject are available at www.dttas.gov.ie/data protection (http://www.dttas.gov.ie/dataprotection). Details of this policy are also available in hard copy upon request by emailing dataprotection@dttas.gov.ie (mailto:dataprotection@dttas.gov.ie) or in writing to Data Protection Unit, Department of Transport, Tourism and Sport, Leeson Lane, Dublin D02 TR60. "The established goal of Motor Taxation in Tipperary County Council is to be a dynamic, flexible and quality driven Department committed to achieving excellent customer service while operating a safe supported working environment." What categories of vehicles are eligible to use motor tax online? Private Cars, Agricultural Tractors/Excavators, Motorcycles, Exempt Vehicle (i.e. Vehicles adapted for use by disabled persons), Vintage/Veteran Vehicles, Goods Vehicles once they have a current Certificate of Roadworthiness, may be taxed online. The site facilitates the payment of up to 3 months arrears, after which time your PIN number will become inactive and your motor tax transaction must be completed through your local motor tax office. What are the opening hours of the Motor Tax Office? Clonmel 9.00 am to 1.00 pm Monday To Friday. Nenagh 9.00 am to 1.00 pm Monday To Friday. I have changed the engine in my vehicle. What must I do to update my vehicle's documentation details? - the Registration (Log) Book, the Vehicle Licencing Certificate or Vehicle Registration Certificate. The Change of engine Section on RF111 must be completed by Main Dealer - who must have Garage Code. A specific letter from Main Dealer who has certified the engine change must also certify the cc of the replacement engine in addition to completing the relevant Section on Form RF111. An updated Vehicle Registration Certificate will be issued to the owner by the Vehicle Registration Unit in due course. How do I apply for an NCT? In writing to: The Customer Services Department, National Car Testing Service, Lakedrive 3026, Citywest Business Campus, Naas Road, Dublin 24. When did I become the owner of my vehicle? You can contact the Department of Transport, Tourism & Sport, Shannon, at 1890 411 412 to check if Change of Ownership has been processed and the date the vehicle transferred into their name or you can contact the Customer Service Desk and ask them to check the NVDF system to see if vehicle has been put into their name. I want to tax my vehicle who do I make the cheque/postal order payable to? Tipperary County Council – Motor Tax Account. I am selling a vehicle privately. What do I need to do? If it is registered on or after 1/1/1993. The reverse side of the Vehicle Registration Certificate to be signed by the seller and the new owner of the vehicle (date of sale should be stated) and sent by the seller to : The Vehicle Registration Unit, Department of Transport, Shannon, Co. Clare. Details of the Change of Ownership will be updated by the Vehicle Registration Unit. The new owner will then receive a Vehicle Registration Certificate in their own name in due course. If my vehicle is registered prior to 1/1/1993. Complete Notification of Transfer Of Vehicle Ownership form RF200 ,to be signed by seller and new owner and date of transfer entered on form .This form together with registration book(brown book) to be sent by the seller to Motor Tax Office who will record transfer and send registration book to new owner. I am selling a vehicle to a motor dealer. What do I need to do? If your car is registered on or after 1/1/1993.You need to: Complete reverse side of Vehicle Registration Certificate and give same to the Motor Dealer. A Notification of Transfer of Vehicle Ownership to a Motor Dealer [ Form RF105 ] must also be completed and signed by both parties and sent to : The Vehicle Registration Unit, Department of the Transport, Shannon Town Centre, Co. Clare. The Vehicle Registration Unit will temporarily transfer ownership of the vehicle to the Dealer until such time as the vehicle is sold on by them. If your car is registered prior to 1/1/1993.Complete Notification of Transfer Of Vehicle Ownership form RF200, to be signed by seller and Motor Dealer, with date of sale and “Garage Code” of dealer entered and sent by the seller to Motor Tax Office. The registration book should not be sent to Motor Tax Office but should be given to the Motor Dealer which is held by Motor Dealer until vehicle is sold. Where do I go to renew my Driver licence? From Tuesday 29th October 2013 all applications must be made in any of the NDLS (National Driving Licence Service) centres nationwide – refer to website www.ndls.ie. Tel no. 0761 087 880. 10 Silver Street, Nenagh, Co. Tipperary. My tax is expiring at the end of the month and i will not be using the vehicle for the next few months - what can I do? From the 1st October 2013 if a vehicle is not going to be in use in a public place, a declaration (Form RF150) must be made to your local motor tax office or at www.motortax.ie during the month that the current tax is expiring. You can take the vehicle off the road for a minimum of 3 months- maximum of 12 months. In the event of the purchase of a vehicle, RF 150 Form must be submitted to Motor Tax Office within 21 days of the date of sale given at the notification of transfer of vehicle ownership. Where a vehicle is imported, RF150 must be submitted within 21 days of the date vehicle was registered in the state. Similarly, a brand new vehicle must be notified within 21 days of the date of registration. In the event of the vehicle going on road during anytime of the declared off-road period you may tax as normal from the date it goes on road. I’ve lost a document. How Can I get a replacement? You must complete an Application for Replacement Documents (RF134 Form) declaring what document(s) have been lost and have this form witnessed and stamped by a member of the Garda Siochana. I did not get my Motor Tax Renewal Form – what can I do? If the person last taxed their vehicle on-line they will not get a physical Renewal Form instead they will be notified by email. This email will have their Pin No. which will allow them to tax on-line. If they didn’t tax on-line previously the Form RF100A – Motor Tax Renewal Form - should be posted to them from the CSD. What do I need to renew the tax on my Private Car? To renew you motor tax you will need the following:- If there is no change in the details of the vehicle and its owner, you will need the RF100B – computerised reminder posted to the registered owner of the vehicle from the Vehicle Registration Unit in Shannon. 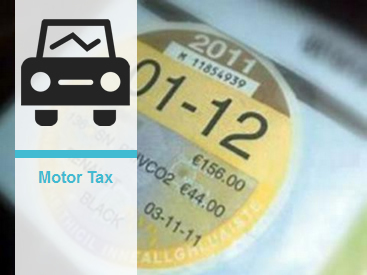 If your reminder has a PIN Number printed on it you can tax your vehicle online via www.motortax.ie. You will also need Current Vehicle Insurance Details and the appropriate Fee. How do I get my PIN Number if I lost it or can’t locate it? To retrieve your Pin No go to www.motortax.ie and click on "Pin Retrieval". A new Pin No. should issue straight away. You may also use the last six digits of the Serial No. on the top of the first page of the Registration Certificate as Pin No. If this is unsuccessful you will have to contact the Department of Transport, Tourism & Sport, Shannon, Co. Clare at 1890 411 412. Please note that the Motor Taxation Office has no responsibility for Motor Tax On-line as it is operated exclusively by the Department of Transport. What documentation do I need to tax a new / imported vehicle, for personal use? Form RF100 (from garage or If vehicle is imported form can be downloaded from NCT website or direct from NCT test centre. The vehicle must be brought to an NCT Centre for registration if imported). Only 25 of the current NCT centres will be operating this service for Revenue and the nearest centres are Waterford, Kilkenny and Nenagh. Confirmation of current Insurance details. When the vehicle has been taxed for the first time, a Vehicle Registration Certificate will then be issued to the owner of the Vehicle. My e-mail address has changed since I last taxed – what can I do? If the email address at which you previously taxed on-line has changed you can get a new Pin No. by again going to www.motortax.ie and click on Pin Retrieval and enter the new email address. A new Pin will issue by return to the updated email address. What documentation do I need to renew the tax on my Motorcycle ? My goods vehicle is out of tax and I need to get it tested at a DOE centre. Can I bring it to the test centre without it being taxed? Yes, you can bring your vehicle to the test centre, and if it needs to be repaired, back to a garage without it being taxed. If you are bringing the vehicle to a test centre, it would be advisable to carry a copy of the appointment letter for the test or re-test with you in case you are stopped by Gardai. What documentation do I need to tax a Small Public Service Vehicle (SPSV), Taxis, Limousines etc.? Small Public Service Vehicle Licences are categorised as Hackneys, Limousines, Taxis and Wheelchair Accessible Taxis. In each case the documentation for taxation is the same. What vehicles need a Certificate of Road worthiness? Mechanically propelled vehicles, registered for one year or more, used for the carriage of passengers with more than 8 seats, not including the driver e.g. a bus. Goods vehicles, registered for one year or more. NOTE- Goods vehicles which are taxed privately also require a Certificate of Roadworthiness Once the vehicle is over ONE year old. .
Goods trailers, registered for one year or more, having an unladen weight exceeding 1,524 kilograms. .
Ambulances, registered for one year or more..
Motor Campervans, DOE cert for Motor Campervans follow the same procedure as for private cars i.e. a DOE cert is required on the fourth anniversary of first registration and is re-tested every other year. When a Motor Campervan is ten years old, a DOE test needs to be carried out every year.. I want to test a vehicle - where do I go? Coleville Hunt Cashel Road, Clonmel 052 6127600 – Light Only. Surehaul Ltd Cahir Rd, Clonmel 052 6138130. James Deveraux Commericals Cahir, Co. Tipperary 052 7441014. F&M Motors Stradavoher, Thurles 0504-21188, 087-2621470. Moyles Garage Birr Road, Nenagh 067-31019. Templemore Motor Works Ltd The Mall, Templemore 0504-31222. Youngs Garage Ltd Roscrea 0505-21266. Thurles Test Centre Archerstown Industrial Estate, Turtulla, Thurles 0504-26472, 087-2307038. I want to have my vehicle weighed, where do I go? I wish to change the name or address on my vehicle documentation. What do I need to do? The Vehicle Registration Unit, Department of Transport, Shannon Town, Co. Clare. Marriage Certificate - if change of name is by marriage. Birth certificate - if you are reverting to your maiden name.. Solicitor's Letter - if you are changing your name by deed poll..
What is the cost of taxing a car? See attached list of Rates. Where can I get information on Exempt Taxation of Vehicles? A vehicle is classed as a vintage/veteran once its 30 years old from date of manufacture and a concessionary rate of motor tax applies – See List of Motor Tax Rates. Appropriate fee -See List of Motor Tax Rates. If the vehicle owner does not have the appropriate registration documents clearly showing the date of manufacture and the Motor Tax office is unable to trace any details of same from the National Vehicle Computer system then the vehicle will have to be re-registered with NCT and get a new Registration No. When are Motor Tax Arrears charged? Motor Tax Arrears are charged if a month or more has lapsed between the expiry of your last disc and the month in which you want to re-tax your vehicle. See list of Motor Tax Rates for amount of arrears. Sorry, there are no Motor Tax news items available at this time. Pay Motor Tax Online is a secure service provided by Ireland's local authorities and the Department of Transport, Tourism & Sport. Whether you are just browsing or wish to pay your motor tax, we hope you find the site useful and convenient.